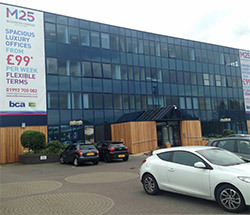 Our Waltham Abbey branch is located off the M25 on Brooker Road. We’re located less than five minutes away from Town Mead Park and Garden. We’re also a similar distance away from Waltham Abbey Cemetery, Waltham Abbey Football Club and the Essex Arrows Baseball Club, so there are plenty of landmarks around to make finding us really easy. One thing’s for sure, we’re certain you’ll feel like you’ve hit a home run when we give you a great deal to sell your car! Thinking to yourself “I really want to sell my car in Waltham Abbey, but who’ll give me the best deal?” If so, get in touch with WeWantAnyCar.com today. You’re sure to get a great deal on your car with us! You may wonder why we’re so confident of our deals. Well, if you sell your car in Waltham Abbey with us, it’s really easy to explain, simply put – we won’t be beaten on price! Should you find a better deal with one of our competitors – we’ll match it! All we need is a quote based on a physical inspection and we’ll match the price they offer. That’s what makes WeWantAnyCar.com stand out from the pack! Not only will we not be beaten on price, but the entire process of selling your car with us is a doddle. Just use our FREE valuation tool to fill in your registration number, add a few extra details about your vehicle such as its mileage, if it has leather seats or any other extra features, and we’ll be able to provide you with an instant, no obligation quote. Easy. Once you’ve agreed upon the quote for your vehicle, selling your car to us is as easy as arranging a date to suit your needs with our Waltham Abbey branch. Our service is so fast and efficient this can often be arranged within as little as 24 hours. The full payment for your car will then be transferred to your bank account. Instead of just sitting there thinking “Who’ll give me the best deal to sell my car in Waltham Abbey?” then, pick up the phone or fill in our free car valuation tool today. We’re certain you’ll find WeWantAnyCar.com is the quickest most efficient way to sell your car in Waltham Abbey and other areas of South West Essex. Don’t hesitate, contact WeWantAnyCar.com today! Excellent service and a great price for the car.Couldn't be happier. Very pleasant experience compared to a private sale, and a better price than part ex. Watch any scrapes and scratches as you'll be charged full prIce for fixing them, but I was happy prIce was fair and would definitely use them again, and would recommend them to others. I sold the vehicle actually - good service,price agreed, payment received by bank transfer two days later. Would use again. Very easy experience. The guy I dealt with was so helpful and nice. Gave me an excellent price much more than other companies. Will certainly recommend we want any car. Better price than competitors. Easy process and fast payment. Having never used a car buying service in the past, but due to busy work commitments I thought I would give this company a try as their offer was higher than the competition. The experience turned out to be extremely positive, with absolutely no hassle or unwanted negotiation. The representative was very friendly and easy to deal with, even complimenting the condition of the vehicle, and did not try to find fault to bring the offer price down. I was paid exactly the amount on the quote, with the money transferred to my account on the same day. I would definitely use this company again, providing you have described your vehicle's condition accurately the whole process is a quick, simply and easy way to avoid the hassle of selling privately. Good price, excellent service from the Walthsm Abbey office. I recently sold my 1 year old (2015) Mercedes C-Class to we want any car, my whole experience during this process from start to end was excellent. First of all, I received the best and the highest quote from them after trying various other famous online car buying sites as well, then when I reached their Waltham Abbey center for finally selling my car, the person (Sunny) who dealt with me and explained everything, he was very honest, open and he managed the whole process very well. I was actually not sure to handover and sell my car on that day but Sunny professional and confident way of dealing with me completely changed my mind and I sold my car. overall, an easy and hassle free way of selling car.